During tough economic times, it seems there's no stopping the entrepreneurial spirit of Tennesseans. The nation's 17th largest state by population saw its unemployment rate fall substantially over the past year. While companies struggled to add jobs, many Tennesseans took it upon themselves to find work on their own -- either by starting their own businesses, picking up freelance work or offering their own services from lawn maintenance to home repair, says William Fox, economics professor at the University of Tennessee. "It doesn't appear that businesses were hiring much," Fox says, citing difference between the business survey and the separate household survey used to calculate the unemployment rate. The household survey showed that the labor force grew by 2.3% and employment rose by 3.8% over the past year, while the business survey showed only a 1% jump in employment. The difference suggests that while businesses aren't exactly hiring more, workers have nevertheless found work. 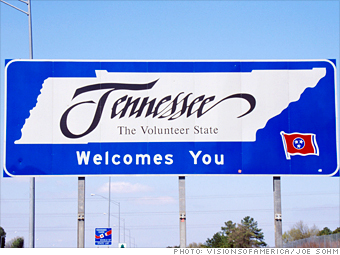 Way to pull yourself up by your bootstraps, Tennessee.